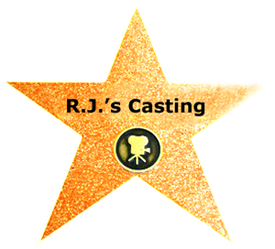 R.J.’s Casting, Inc. is a full service casting company providing services for the Film and Television industry. Fully equipped for any size budget big or small. Studio casting, real people, Sports casting on location. Having a full traveling studio you can have your Callbacks at your hotel or close to where you are shooting. We are located in Orlando, and work all over Florida. Very Production friendly. Call our offices at 407-230-6492. Specializing in kids, theme parks, live action, print, extras, for commercials and feature films. Our goal is to satisfy all of your casting needs. We now offer Green, Blue or Gray backdrops. New lighting and audio, looks and sounds great for on line viewing. Credits include: Pytka, Leo Burnett, DDB, Go Films, MJZ, American Express, McDonalds, Pepsi, Disney/Disney Cruise Lines, Buick, Busch Gardens, Universal, Sea World and many more!!! © R.J.'s Casting. All Rights Reserved.